Many thanks for your interest in the International Research Project „Bilderfahrzeuge. Aby Warburg’s Legacy and the Future of Iconology“. 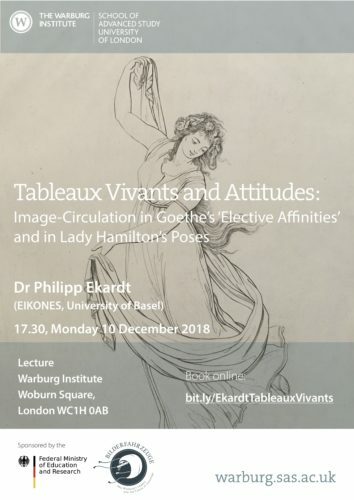 (1809), as well as Lady Hamilton’s ‘attitudes’ – offering a perspective on the mechanisms of image-circulation at that historical and cultural moment. Investigating Goethe and Hamilton also allows us to differentiate our general understanding of image-transmissions. creation of vistas in parks have their place. Postdoctoral Research Position for 2 years at the Max Weber Stiftung – India Branch Office (IBO) in New Delhi. Pay will be in keeping with the current rules of the German embassy in India. The Max Weber Stiftung – India Branch Office (IBO) invites applications from postdoctoral scholars for the position of a Junior Research Associate for 2 years to be based at the IBO in New Delhi. The candidate is expected to contribute to the international research network “Bilderfahrzeuge (Image Vehicles): Aby Warburg’s Legacy and the Future of Iconology”, supported by the German Ministry of Education and Research, and realized in a collaboration of the Warburg Institute, London, with German partner institutions (see list below). The objective of this project is to explore the migration of images, objects, and ideas in a broad historical and geographical perspective. In particular, it seeks to provide a contribution to the history of images which is based on Aby Warburg’s approach and method, rethinking them in the light of new interdisciplinary, international scholarship. For further information on the research network see https://iconology.hypotheses.org/. Please apply electronically in one pdf.-document with cover letter, CV, copy of PhD degree, project description (max. 4 pages), a writing sample and names of two referees to Prof. Dr. Gehard Wolf (dirwolf@khi.fi.it) by 20 November 2018. A copy of this text as a PDF file is available here. The Warburg Institute, Max Weber-Stiftung, Institut für Kunst- und Bildgeschichte, Humboldt Universität zu Berlin, Kunstgeschichtliches Seminar/Warburg-Haus, Universität Hamburg, Kunsthistorisches Institut Florenz/Max-Planck-Gesellschaft, Kunsthistorisches Seminar Universität Basel. Congratulations #21: Eva Cancik-Kirschbaum / Babette Schnitzlein (ed. ), Keilschriftartefakte. Untersuchungen zur Materialität von Keilschriftdokumenten, Berliner Beiträge zum Vorderen Orient, Band 26, Gladbeck 2018. Berliner Beiträge zum Vorderen Orient, Band 26, Gladbeck 2018. The primary writing support for cuneiform is the (unbaked) clay tablet, which was inscribed while the clay was still moist. However, one look at the collections of the British Museum and one soon realises that cuneiform was not confined to this medium, but utilizes a number of other supports, such as clay cylinders and prisms or stone slabs and stone ducks. While usually concentrating on the decipherment and study of texts, cuneiform studies have, in recent years, paid more and more attention to the materiality of inscribed objects. Such was the case at a workshop on the materiality of the writing process which took place on 29 April 2013 at the Freie Universität Berlin. Nicht zuletzt stärkt der Verbund die Beziehungen der deutschen und britischen Geisteswissenschaften unter den neuen politischen Gegebenheiten des bevorstehenden BREXIT. Das Engagement entspricht zudem der besonderen historischen Verantwortung Deutschlands gegenüber dem Erbe Aby Warburgs: Die Kulturwissenschaftliche Bibliothek Warburg hat Deutschland 1933 verlassen müssen und in London eine neue Heimat gefunden. Since 2013, the German Federal Ministry of Education and Research (Bundesministerium für Bildung und Forschung – BMBF) has generously funded the international research project “Bilderfahrzeuge – Warburg’s Legacy and the Future of Iconology.” The project is dedicated to art historical and cultural historical research. Its central hub is situated at the Warburg Institute in London in collaboration with the Max Weber Stiftung, the Universität Hamburg / Warburg-Haus, the Humboldt-Universität zu Berlin, the Max-Planck-Gesellschaft and the Universität Basel. Following on from a highly successful first period of the project, the BMBF will provide a further round of funding for another five years until 2023 with a total of 6.3 million Euros. The project’s central aim is to investigate the migration of images, objects, texts and ideas across geographical and chronological borders. The work of the German-Jewish cultural and art historian Aby Warburg (1866-1929) and his Library of Cultural Studies (Kulturwissenschaftliche Bibliothek Warburg – KBW) remains at the heart of the further period of research. Particularly with regard to the methodological approach of an iconology in the sense of a science of images, as it has been increasingly expanded and refined over the last few decades. New emphases will be set for the second period by the following key aspects: “Political iconology – images as agents in the political sphere,” “Global image vehicles and migrating memories” and “Art and Nation.” Following an evaluation and positive appraisal in autumn 2017 of the work undertaken during the first period of research, a second research period will commence from the 1st of July 2018. For this, the German Federal Ministry of Education and Research (BMBF) will provide 6.3 million Euros for a further five years. With their generous support of the “Bilderfahrzeuge” project, the BMBF supports young academics both on a national and international level: facilitating pathways into international research, increasing their mobility and improving the cooperation between European research organisations and institutions. At a time when the Brexit process is redefining political realities, the project and its members strengthen the interrelations between the German and British humanities and sciences. The support the project mainly based at the Warburg Institute receives by the German government through the BMBF also corresponds to Germany’s particular responsibility towards the legacy of Aby Warburg: The KBW was forced to leave Germany in 1933, finding a new home at the University of London. The project is based on the conceptual foundation of the term “Bilderfahrzeuge” (literally ‘image vehicle’). This metaphor was conceived by the German-Jewish cultural and art historian Aby Warburg. In doing so, Warburg attempted to describe the way in which image formulas have been multiplied and disseminated through time and to distant places. Within the project, the function of such processes of the migration of images, objects, texts and ideas is examined within the formation, transformation, and interaction of cultures. The research undertaken is conceived in the form of individual monographs, regular workshops and annual conferences, as well as a continuous lecture series which takes place at the Warburg Institute in London. The majority of the 15 Research Associates, supported in partnership with the Max Weber Stiftung are situated at the central hub of the project at the Warburg Institute in London. In Germany, Research Associates of the project will be placed within the Warburg-Haus of the Universität Hamburg and the Institut für Kunst- und Bildgeschichte at the Humboldt-Universität zu Berlin. The directors responsible for the project are Professors Andreas Beyer (Universität Basel, who also functions as the Speaker of the project), Horst Bredekamp (Humboldt-Universität zu Berlin), Uwe Fleckner (Universität Hamburg, Warburg-Haus), Bill Sherman (The Warburg Institute, London) and Gerhard Wolf (Kunsthistorisches Institut Florenz/ Max-Planck-Institut). Permanent Guests on the directorial board are Professors Charlotte Klonk and Michaela Marek (both Humboldt-Universität zu Berlin) and Professor Hubert Locher (Deutsches Dokumentationszentrum für Kunstgeschichte – Bildarchiv Foto Marburg). Detail of the map of the harbour of Civitavecchia, 1634, Fresco, Galleria delle carte geografiche, Vatican. Programme available as a PDF here. If Aby Warburg’s goal was to establish the autonomy of the image, that goal has certainly reached its apotheosis with the rise of digital media. On Twitter, Facebook, Instagram and Snapchat, images reign, and they have become powerful tools of manipulation and persuasion. The rise and fall of the Viking “Allah” story, which captured headlines around the world for its seductive claims about the discovery of a Viking textile with Arabic writing, was propagated and argued largely by means of a highly manipulated image, but it was also a sequence of images that allowed me to deconstruct false claims about the textile, when I wrote a 60-tweet Twitter thread debunking the story in October of last year. In this image-rich environment, the work of art historians, cultural historians, and media scholars has never been more urgent, as university administrators work to deconstruct and defund the arts, humanities, and traditional paper libraries, thereby restricting our access to the analog history of images, consigning us to the endless matrix of digital duplication. How can the prescience of Warburg’s vision be put to use in the world of social media image construction and circulation, where “truthiness“ reigns over “truth”? How does Bilderfahrzeuge work in the tangled networks of the digital age? The International Research Group “Bilderfahrzeuge: Aby Warburg’s Legacy and the Future of Iconology”, supported by the German Bundesministerium für Bildung und Forschung invites applications for several full-time research posts (in principle post-doctoral) based at the Warburg Institute in London, the Warburg-Haus in Hamburg and at the Humboldt Universität zu Berlin for up to five years from July 2018 or as soon as possible thereafter. A detailed description of the positions can be found below or, for a PDF version, please follow the link here. The objective of this project is to explore the migration of images, objects, and ideas in a broad historical and geographical perspective. In particular, it seeks to provide a contribution to the history of images which is based on Aby Warburg’s approach and method, rethinking them in the light of new interdisciplinary, international scholarship. The project will reconstruct and develop a rich scholarly approach which addresses the distinctiveness of images while also studying the language in which ideas about transfers between cultures and ideas about images are expressed. A focus also lies on the political impact of global visual culture. We are particularly interested in applicants with a high level of research skills in art history, transfer phenomena between Europe, Asia, Africa and the Americas, in anthropology, the history of science and comparative literature. Applicants will be expected to have a good knowledge of the languages relevant to their field of study and a good speaking and reading knowledge of English and a second language, preferably German. All participating institutions are committed to increasing the number of women in academic posts and would therefore particularly welcome applications from women. Where there is a choice between equally qualified male and female applicants, a female applicant will be chosen. Applications should indicate the alphabetic character of the respective post, include a letter of application with a specific research proposal and indicating candidates’ interests in and suitability for the projects of the research group, a curriculum vitae and publications list, the names of three referees and a writing sample of around 5,000 words of published or unpublished research. Completed applications (electronic submissions only) must be submitted by Monday 30th April 2018. Interviews will be held in Berlin and London in June or July 2018. Andreas Beyer/Basel (Speaker), Horst Bredekamp/Berlin, Uwe Fleckner/Hamburg, Bill Shermann/London, Gerhard Wolf/Florence. Permanent members of the board : Charlotte Klonk/Berlin, Michaela Marek/Berlin and Hubert Locher/Marburg. A: Research position in art history/comparative literature: The formation of Aby Warburg’s language and its impact his sources and his neologisms. Workplace: London. B: Research position in art history/history of science/anthropology: Warburgs interest in Psychology – investigating his writings and his library. Workplace: London. C: Research position in pre-Columbian art history with a focus on the migration of images across time, space and across media in and between pre-Columbian cultures and up to the early colonial period. Workplace: Berlin. D: Research position in Chinese or South East Asian art histories and languages with a focus on migration, transformation and relocation of images and artefacts across time, space and media. Workplace: Berlin. E: Research position in comparative literature, ethnology or art history regarding mobile / transcultural dynamics of memory with a focus on narratives, material culture and / or images (for example photography). Workplace: London. F: Research position in art history with a focus on Western or global political or religio-political iconology / agency of political images (early modern times to contemporary). Workplace: Hamburg. H: Research position in art history with a focus on Western or global political or religio-political iconology / agency of political images (early modern times to contemporary). Workplace: London. J: Research position in art history focusing on the question of the shaping of a British canon – Arts Council; British Council; Royal and Government Collections. Workplace: London. K: Research position in art history focusing on “The Englishness of English Art” through non-English eyes – Contributions to a national definition of British art by those coming to it from outside. Workplace: London. L: Research position in art history, focusing on collections/reception of Western/European art in Non-Western countries. Workplace: Berlin. Martin de Wild working on a X-radiograph in his laboratory, ca. 1930. Despite experimentation with X-Ray technology applied to the diagnosis of paintings in German science laboratories in the first decade of the twentieth century, it was only in the 1920s and 1930s that the technology became more widely and systematically applied to art. Alan Burrough’s acquisition of the first and extensive archive of X-ray images of paintings, first of the Fogg Art Museum in Cambridge, Massachusetts, was the most important driving force behind this. Burrough’s efforts were inspirational for Kurt Wehlte, the German Maltechniker, who in the 1930s established a laboratory for the X-Ray investigation of paintings in Berlin. In this talk, Professor Dupré will speak about how and in which ways X-ray investigations of paintings were consequential for art history.